Another wonderful flax from New Zealand, Phormium cookianum (syn. Phormium colensoi) is a strap leafed perennial sometimes known as the ‘Mountain Flax’. Smaller growing than P. tenax and with graceful drooping foliage Phormium cookianum is also a little more shade tolerant. A clumping evergreen perennial flax reaching around 1 – 2 m depending on cultivar. P. cookianum is an excellent choice for a range of landscaping applications where larger flax varieties are not suitable. As a border plant, a clump in the border or rock garden or grown in a container this is an easy care low maintenance plant. Excellent for mass planting in larger landscape situations. P. cookianum subsp. 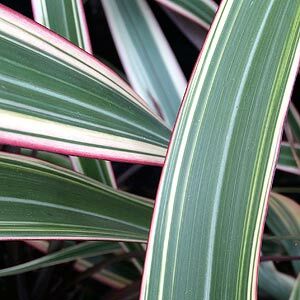 hookeri ‘Tricolor’ with its green and yellow striped foliage tinged with red is an excellent cultivar.